Our findings are used in a wide variety of ways to help families, providers, clergy, youth and policymakers to decrease risk and promote well-being for LGBT children and youth and to strengthen families. 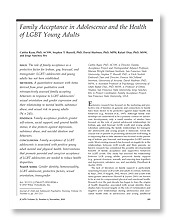 We are continuing to release key publications and resources to make our findings, family intervention strategies and research-based practice information widely available for use in primary care, mental health, family services, schools, child welfare, juvenile justice and homeless services and congregations to build healthy futures for LGBT children and adolescents in the context of their families, cultures and faith communities. Let us know if you can help disseminate our research-based resources, coordinate our trainings or support other cultural versions of our family education materials, including our award-winning family education booklets and videos. 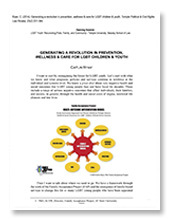 We provide training on using our multicultural family education booklets and other resources with providers, religious leaders, parents, families, foster families and caregivers of LGBT youth. And we train on our new evidence-based family intervention model to reduce risk and promote well-being for LGBT children and youth in the context of their families, cultures and faith communities. Key information from our research on how families can help support their lesbian, gay, bisexual and transgender (LGBT) children. 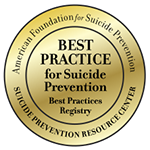 These family education booklets have been designated as “Best Practice” resources for suicide prevention for LGBT people by the national Best Practices Registry for Suicide Prevention. Overview of the Family Acceptance Project®'s work to establish a new field of family acceptance and intervention to help families learn to support their LGBT children that puts this work in historical context. 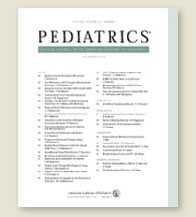 Published in the January 2009 issue of Pediatrics, journal of the American Academy of Pediatrics. 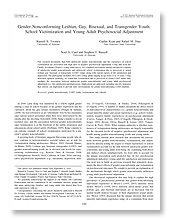 First guidelines for policy and practice for serving LGBT youth in child welfare and juvenile justice settings. 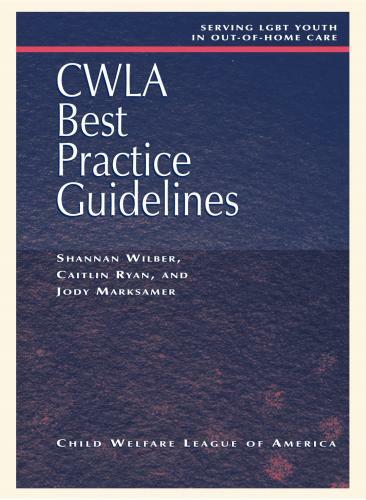 Written by experts in the field and published by the Child Welfare League of America (CWLA) as part of their Best Practices series, this book is based on the work of the Model Standards Project and research from the Family Acceptance Project® informed and framed the guidelines.